Do you ever think you have big problems, lotsa stuff to do, things to solve, places to be, kids to untangle, blood sugars to track, or just not enough sleep? Well, I do too. But. Meri isn't so blessed with the regular problems like you and I have today (..ok, she has those PLUS). She's waging an intense battle with her husband's cancer right now. Can you even imagine? I've tried to over and over again. It keeps me in the here and now..praying for Meri and Ryan. All day, my thoughts (and prayers) come back to them. Take a minute and go visit, Meri is an amazing mom who balances four great boys (three with diabetes!) with grace and a great sense of humor. 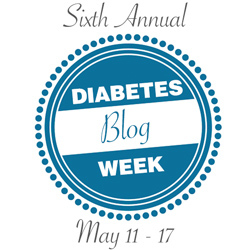 Here's her blog: ourdiabeticlife.com Please, please add them to your prayer requests, they could use a miracle! We love you, Meri!! Thank you so much, Holly! All the prayers are only a blessing to our family!